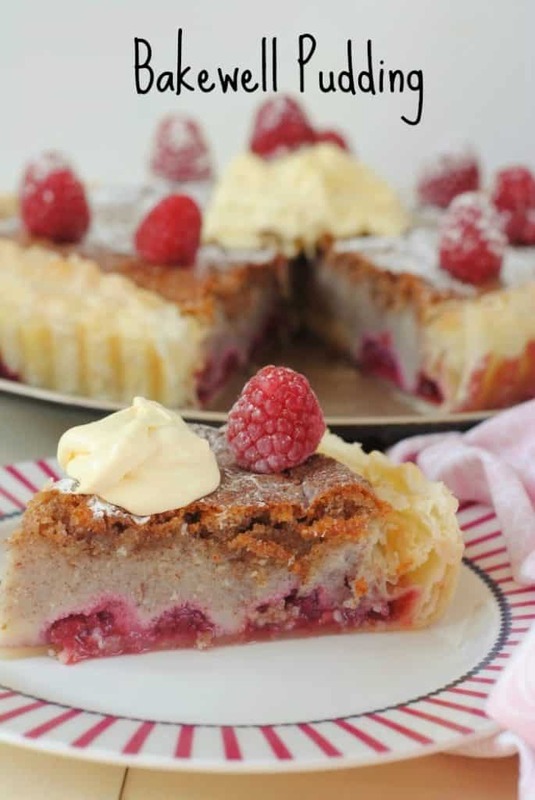 Bakewell pudding is an English dessert that originated in the Derbyshire town of Bakewell. It’s made from a flaky pastry base, with a layer of jam and topping with an egg and almond filling. It’s a dessert that many of us grew up eating, so it’s time that we re-familiarise ourselves with it. We post a lot of worldwide cuisine here on Hungry Healthy Happy, but very little British cuisine. 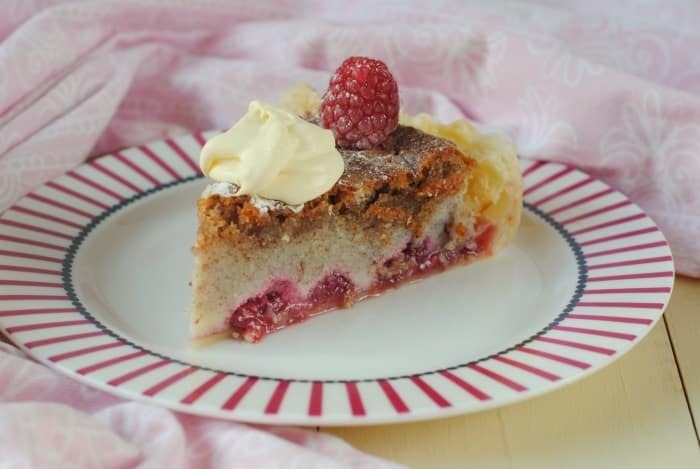 Whilst Dannii grew up eating more continental European food (because of her Belgian heritage), I grew up eating pretty traditional British food like roast dinners, shepherd’s pies and desserts like treacle pudding and this Bakewell pudding. 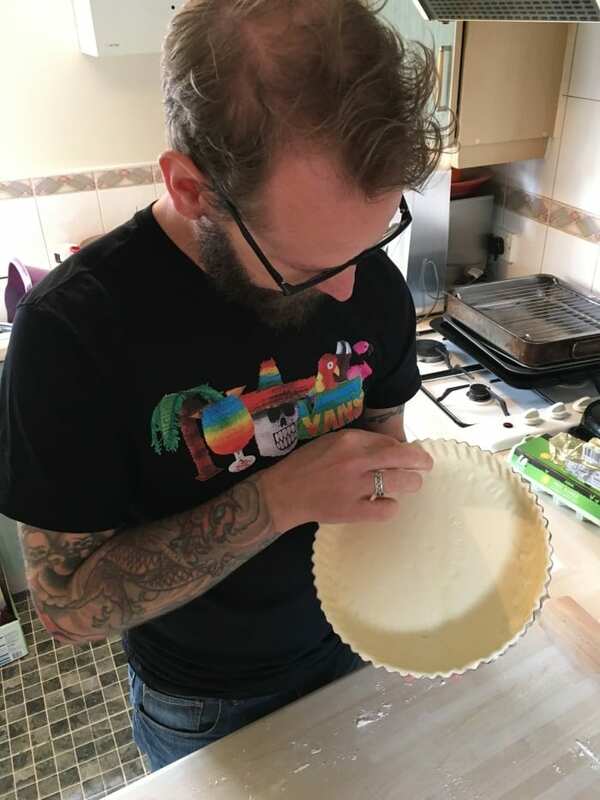 You will notice the influences of Dannii’s upbringing in her recipes here (although you would be forgiven for thinking she grew up in Mexico), so now I have joined the blog full-time I will be sharing some of the British recipes that I grew up with. Hello, It’s Dave here! You may have guessed that from the previous paragraph. Happy Monday everyone! It’s been a really busy weekend here, as we have started decorating the baby’s nursery. Dannii’s mum has visiting for a few days and she has been helping me with the painting, as obviously Dannii can’t be around paint fumes. 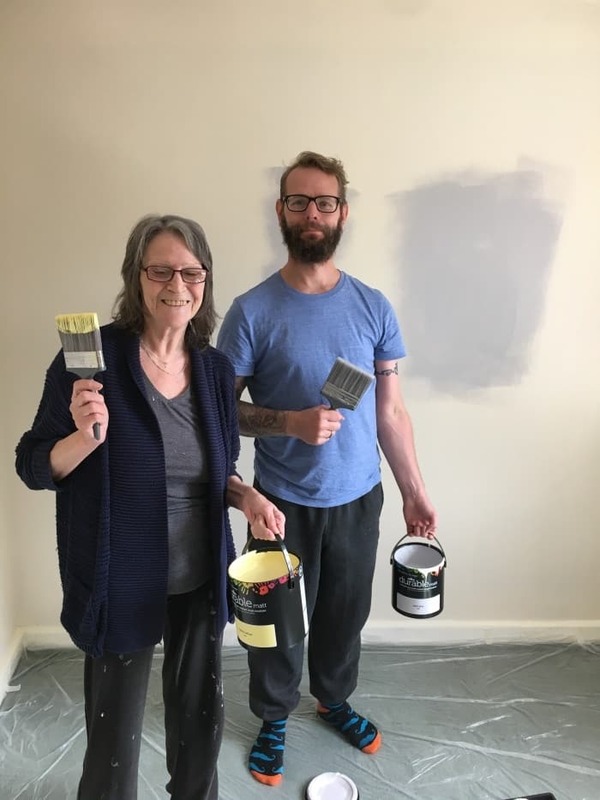 We have gone with gender neutral (although we do know the gender – more on that coming soon) yellow and grey for the walls and it’s all looking really good. Dannii will be doing a more detailed nursery transform post later down the line, when we have furniture and stuff, but for now it is just painted walls. All of that painting is hungry work, so we definitely deserved some dessert. Of course we promote lots of fruit and vegetables, wholegrains and healthy protein on the blog, but we also promote balance. Dannii’s main craving throughout the pregnancy so far, along with potatoes, has been cake. Maybe I should make a potato cake…maybe not. So we have been making an effort to make sure that all the cakes we eat are at least homemade. Sure, they are still full of butter and sugar, but we know exactly what has gone in to them, we can control the portions and they are always going to taste better than disappointing store bought stuff. Everything in moderation, and we maybe bake something once a week and try to make sure it is something that freezes well. Once baby arrives and we have lots of visitors coming round for baby cuddles, we are going to have a freezer stocked full of cake to offer them. 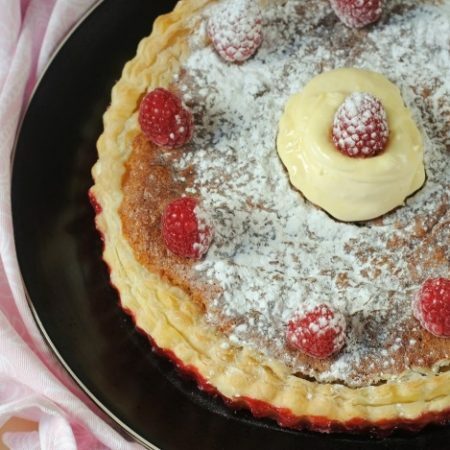 The UK has a lot of amazing regional recipes like Yorkshire puddings, Eccles cakes, Cumberland sausage, Cornish pasty, Lancashire hot pot and this Bakewell pudding to name a few. Those of you that have travelled well in the UK will have no doubt tried many of these regional dishes. 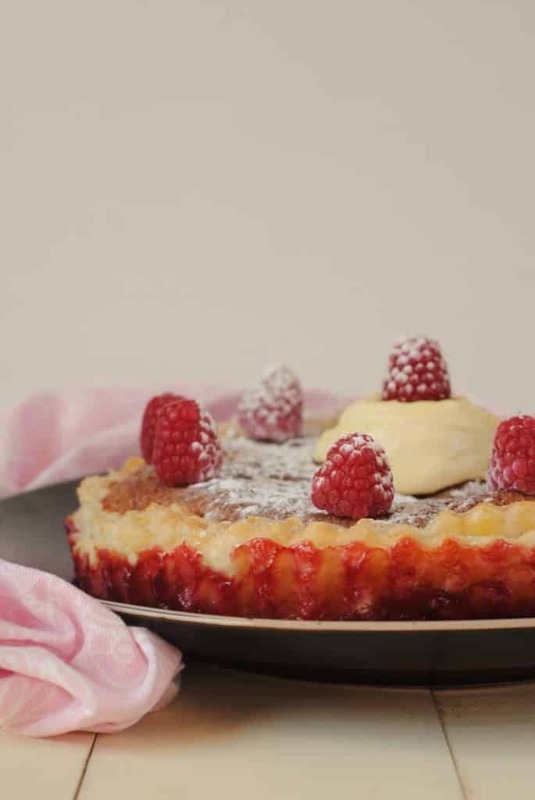 We have teamed up with Cottages.com to share with you our favourite British dessert, which is from the area that I grew up in, as they (and we) believe that people holidaying in these areas should know how to make the dishes that the area is famous for. Cottages.com is a self-catering holiday company with thousands of properties located across the UK and the great thing about their cottages is that you are on a self-catering holiday and having the flexibility of having your own kitchen means that you can make things like this, or enjoy the local restaurants. 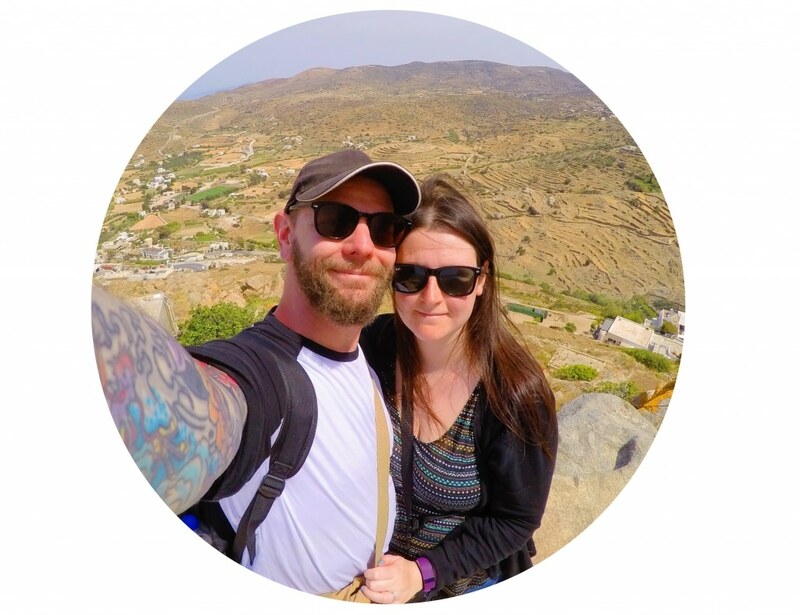 When baby arrives, we are going to be making the most of holidaying closer to home by renting a property with Cottages.com and having our own kitchen will make things much easier. There are some absolutely beautiful holiday properties in Derbyshire, so you can not only enjoy the stunning countryside, but the local food like this too. Until then, try making it yourself! How about we have a little history lesson before we get in to the recipe? Firstly, do we call it a bakewell pudding or a bakewell tart? Nobody knows really, although references to bakewell pudding appear earlier than bakewell tart, with earliest reference dating back to 1826. Although, it is thought that this desert actually dates back to medieval times as far as the 15th century where it was actually made by accident. I have always stood by the fact that the best recipes are made by accident. I am a firm believer that if you add fruit or vegetables to anything, then it instantly becomes healthy. We can make that a rule, can’t we? Strawberries and raspberries are perfect at the moment and I would recommend making the most of them in desserts. Actually, we made a really good raspberry sauce the other day that goes well on frozen yoghurt or ice cream. I will be sharing that recipe soon. 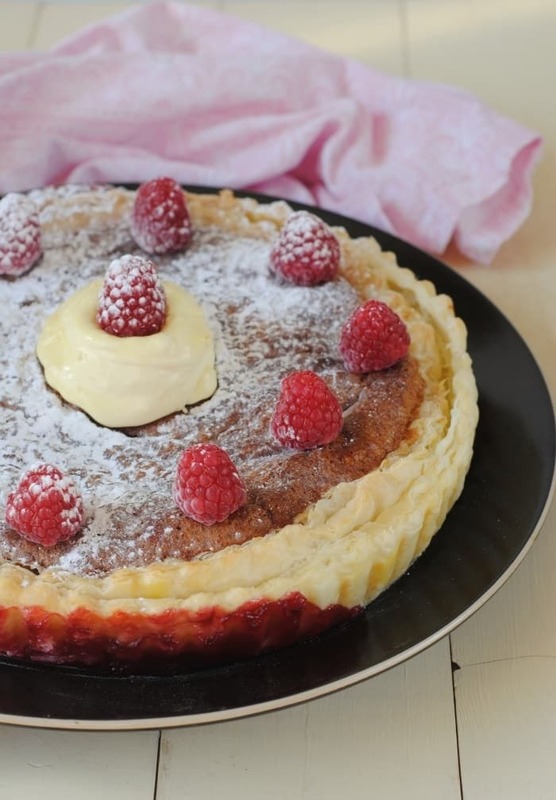 Bakewell Pudding is made from a flaky pastry base, with a layer of jam and topping with an egg and almond filling. Roll out the pastry onto a lightly floured work surface to form a circle a few inches larger than the tart tin. Line the tart tin with the pastry, gently pressing into the edges. Trim the excess pastry from the edge of the tart tin. 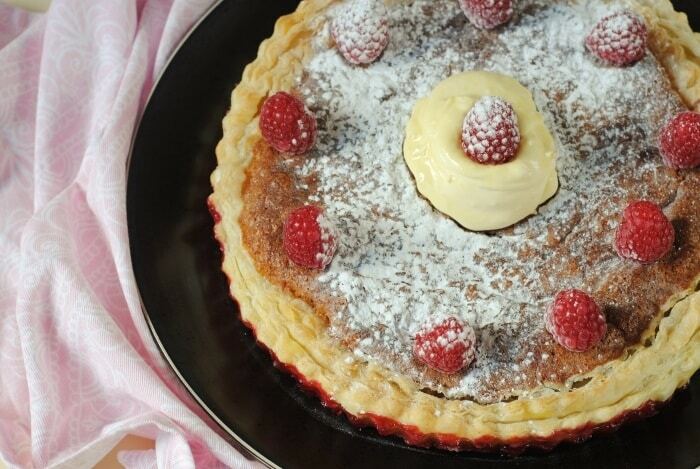 Dust with icing sugar and serve with the remaining raspberries and a dollop of clotted cream. That looks so good. We have used cottages.com before and were really pleased with our cottage. We are booking again for october. Looks really good Dannii! This is perfect for summer! I love Bakewell tart. It was one of my cravings through pregnancy so I get the cake craving! Hi Dave – nice to ‘meet’ you! How lovely that you’ve joined ‘the team’! I went to Bakewell a few weeks ago and had a Bakewell tart from the oldest pudding shop. They were actually serving Bakewell tart and Bakewell pudding as two distinct things! I’ve never heard of this pudding before – learned something new today!! It sounds delicious! And yay for starting the nursery! I absolutely love Bakewell, i think its the Almond flavouring that does it for me! I love bakewell desserts and this looks delicious 🙂 Good luck with the rest of the nursery decorating too. 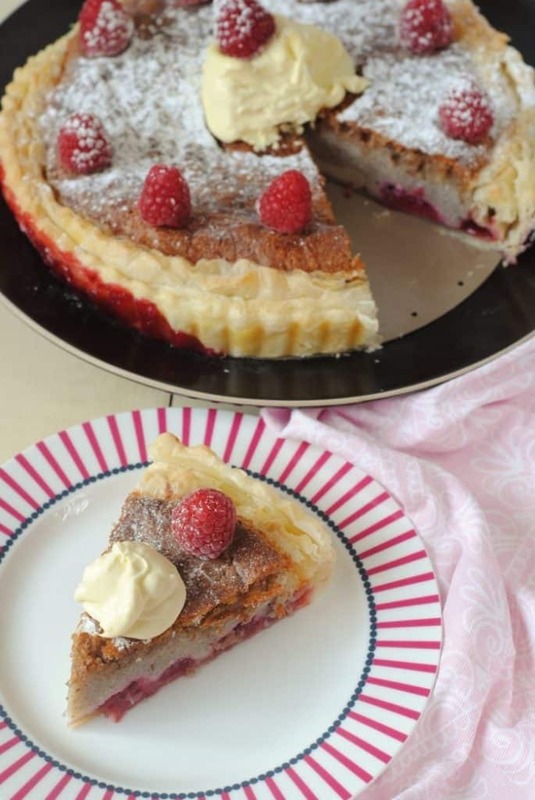 I’ve never had Bakewell pudding before, but I love the sound of the raspberries & jam in it.